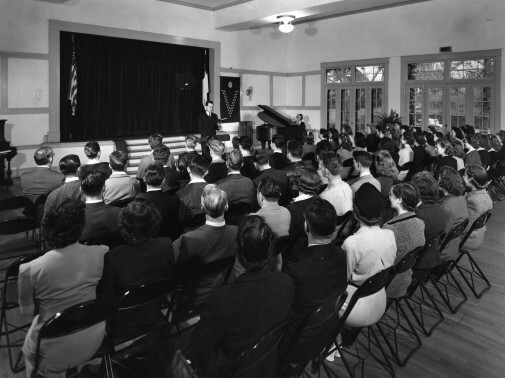 A chapel service at Westmont in Los Angeles in the 1940s. When Ruth Kerr felt God leading her to establish a school in 1937, she focused first on a Bible institute. Rev. Leland Entrekin from First Fundamental Church shared her vision, and three nationally known Bible teachers joined the faculty of the Bible Missionary Institute. The trustees soon broadened the curriculum to include junior college courses, and they embraced a liberal arts curriculum in 1940 when they founded Westmont. But they kept the Christian commitment as a central component of the college’s mission. The early trustees adopted behavioral standards and a statement of faith that focused on basic Christian doctrines, and revisions of these documents continue to shape the Westmont community (see www.westmont.edu/_offices/president/statement_of_faith.html). Over the years, the college has asserted its continued commitment to Christianity. For example, the four-week January Interterm program of the 1970s featured a class on Christian Perspectives on Learning to better acquaint students with Westmont’s mission of integrating faith and learning. The 1995 Long-Range Plan reaffirmed Westmont as an evangelical Christian liberal arts college emphasizing intellectual, spiritual and personal growth. In his 2008 inaugural address, President Gayle D. Beebe pledged his support for the college’s Christian identity and the “unrelenting commitment to academic rigor and an uncompromising emphasis on cultivating a deep love for God” that Wallace Emerson had embraced. In 2011, Westmont created the Martin Institute for Christianity and Culture and the Dallas Willard Center for Spiritual Formation to prepare Christian leaders able to articulate the philosophical, theological and biblical rationale for developing an interactive relationship with Christ. The institute and center will help establish Christian spiritual formation as a discipline of public knowledge and encourage dialog with world Christianity and world religions, engaging scholars nationwide. The Martin Institute and Willard Center join Westmont’s many spiritual life programs and Christian liberal arts curriculum in continuing the college’s Christian identity.